Welcome to the Voynich Hotel, a rundown resort located on an all but deserted island in the South Pacific. Owned by former Mexican wrestler Kandre Umeda, the hotel is maintained by two mysterious maids, Elena and Beluna, as well as a homicidal chef named Amelia. Kuzuki Taizou, a Japanese tourist, comes to stay at the hotel to escape from his dark past. Soon he discovers that the strange occupants and happenings of the island are even more abnormal than what he is used to. Taizou quickly becomes embroiled in the spiderweb of affairs on the island, growing close to many of the residents and helping them out, though often causing even more problems for himself. But when Taizou's past comes to the island to haunt him, his new friends jump to his aid. 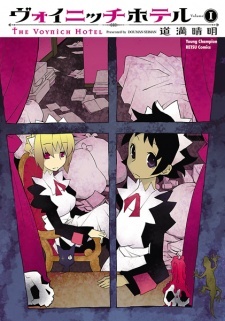 Voynich Hotel has been licensed in English by Seven Seas Entertainment. here you were browsing through the MAL, looking for something fun to read, and by accident you opened this title. plot based on several characters? story about an island? what the heck, why would anybody read this? I won't argue, this is indeed what this manga is about. but by no means is it bad. I could write about the art so great it looks like it was created solely for the purpose of this story. I could tell you that the characters are so vibrant and charismatic you can't decide who's the main cast, and frankly, you don't care because all of them are worthwhile. but I fear i couldn't give this manga justice without sounding biased, so all I will do is reccomend it to you, and hope you will make that first step of reading the first chapter. If I suddenly came into elaborate amounts of money, I would track down Dowman Sayman/Douman Seiman and fund this to be an anime out-of-pocket. It sounds cheesy as hell but I laughed, I cried, I rejoiced.... I felt it all here man. This is a remarkably quirky, original, romantic, and funny manga in many ways that I was not expecting. The art is unique and western inspired but it only adds to the fun of the characters and the plot. Seiman is a master of keeping multiple plot lines going at once that intertwine without one ever getting boring. I genuinely feel this is a perfect manga in terms of story telling. There were no loose ends left even for the most minor of characters. Seiman has a gift of in a sexual, gross, quirky, and funny way making everything enjoyable. I read it all in one sitting and then after had to go outside and experience "post good story ending" syndrome. This is what got me aboard the Seiman fan train. I have since hunted the ends of the earth for every work translated to read in entirety. I literally never shut up about this manga or Seiman and their mastery of awkward romance comedy stories. Sayman Dowman is an extremely interesting creator for two reasons. Firstly is his distinct art style which reminds one of Kouji Kumeta in its poppy sorta-minimalism. Secondly is his story-telling method of stringing together 'short-short' chapters and making sure each chapter resolves as its own small joke although still telling an over-arching story. And also there's that whole 'quirky humor' aspect. This storytelling tradition isn't really new in Japan though. Hoshi Shinichi and Yasutaka Tsuitsui are examples of writers who focused on making short stories that told an interesting set-up and bizarre twist in a few short pages. There's also Kawabata's famous 'palm of the hand stories'. But there's a kind of joyous buzz you get when you read stories in this form, because they're like delicious little bits of confectionery. Each chapter is a surprise. The man of no particular distinction was transported into a different world. He opened his eyes . He was in a small glade with sunlight streaming through the trees. A beautiful witch was standing there. The man of no particular distinction was surprised, but this was exactly what he had read about in the fantasy novels he was addicted to. "Am I in a new world? Can I finally make a name for myself?" he said. "Yes. I have called you here because I want you to destroy a great evil. A tyrant has conquered the city and he razed my village to the ground with his troops. I was the only survivor. I have held vengeance within my heart, seeking for the opportune moment to summon a heroic spirit such as yourself to aid in my vendetta." He felt magic power throb in his muscles. He roared. She led him out of the glade to a camp whereby the rest of her comrades were waiting. They roared in joy as well. They provided him with armor and weapons. They taught him how to fight. The training was tough but he made many friends. A few months later, he was ready. In the dead of the night, the band stormed the castle. The gates were opened thanks to a spy that had managed to get on the inner court's good side. The night guards were surprised, and they were cut down before they could react. Eventually, the rebellion reached the inner sanctum of the King. Seated on the throne was a youth in jeans and a sweater - a man of no particular distinction much like himself. He walked over to the center of the room. He drew out his sword. The first man was flabbergasted. He noticed that his allies were standing by the side. They watched without interfering. "You are now the plaything of an Elder One! This grand show of Rebel and Tyrant is all a sham! If I should slay you, then you will be the next liege, and if you should slay me then I will retain my position! We shall all be eventual losers in this endless dance! And all the winner receives is a short stint of luxury before he has to return to the arena! Even then, that witch will always be there, reminding you that your soul shall eventually be hers to consume!" The first man looked to the witch. She looked the same, but there was something sinister about her now. It was as though, behind that face, was a monster made of many eyes and the countless screams of the forgotten. "The soul that is slain shall be eaten. But there is only one solution! You must die by your own hand! Only that way will you be spared from the accursed tentacles of Azathoth!" The first man was in a pit and confusion as despair. Had it all been a lie? He was still a man of no particular distinction, and he was now going to be consumed in a dark pit of some alien mouth. Either that, or he had to fight to survive, and then die in a later day. He took his blade, and gutted himself. His blood spilled on the floor. The last thing he saw, was the smile of the second man, leering at him with a ghastly face. When the performance was over, the second man breathed a sigh of relief. The 'rebels' cleared the corpse away. The witch walked over to his side and sat on his lap. The night guards that had been 'stabbed' wiped away the fake blood from their armor. "My liege. It seems that the next hero shall appear in the Day of Fires at the Stonehook Mountain. That is what is written in the stars." The second man gave the witch a kiss on the cheek. "Excellent. I am glad to have been the first one to think of this. I don't want any other losers getting in the way of my agricultural reform just because they want to play Hero and lead a meaningless rebellion. Soon, we shall finally have enough men and supplies to assault the Demon King's Castle in the East." Outside of the castle, peasants labored away in square fields. It was the method developed by Chinese civilization that helped to maximize their own growth. But it was a method that did not work unless the people were co-ordinated to ensure that everything was working well together. The king was a pragmatic tyrant. He was inspired by the Legalist methods that he read in history books to help in administration of the Kingdom. The main reason why the Kingdom was so easily besieged by the Demon King was precisely because of this lack of order. The 'heroic spirit' system was a stupidity that made the citizenry constantly look up to the heavens for a savior rather than take matters into their own hands. A few old documents and studies done by the scholars of the inner sanctum even contained the theory that this was an arrangement determined by the Demon King himself - done in order to ensure that only the weakest heroes would stand in his way while keeping the citizenry placated with false hope. But, in a few years, they would finally stand a chance. It was a plan that was not made from relying on heroes, but it was made from the sweat of men. The witch left the king's lap, and headed off to continue her preparation for the next 'summoning'. To help another poor sap get 'adjusted' into his new world. This was going to be a new world all right. Just not what they were expecting. Short version: Voynich Hotel is a comedic slice-of-life series that excels at not taking itself seriously, and ends up being a lot of fun to read. Voynich Hotel is a slice-of-life in a weird setting, much like Aria or YKK. But instead of focusing on the imaginative world of Neo Venezia, Voynich Hotel emphasizes the characters. The backstories of Elena and Taizou aren't tough to figure out, but they comes out one piece at a time, revealed through actions instead of straight-up exposition. In the meantime, these two go through the motions of a normal daily life, but in the midst of witches, zombies, and murderers. Everything that happens is over-the-top crazy, but Voynich Hotel treats it like it's a normal everyday occurrence. This matter-of-fact attitude makes each interaction strange and unpredictable, and that combination is addicting. I read this always thinking, "how could they possibly react to this??" ...and still got pleasantly surprised each time. So what's the worst two things you could put together? Great, now combine them and make it work out. That's the whole feeling of reading Voynich Hotel.